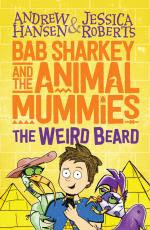 Bab Sharkey and the Animal Mummies - The Weird Beard, is a weird and wacky story. It follows the life of Bab Sharkey, a young 12 year old boy who finds a 4000 year old stinky beard. The inheritance of this beard crowns him as the Pharaoh of Egypt. However, there are others who want the beard for themselves. This book is a creative, fun and overall hilarious story. I would thoroughly recommend it for children aged 8 to 12. One thing I can say for certain about this book…. It’s just a whole of fun!